I’m one of those people who hates camping. I mean I loathe it! Yes, I’ve tried it…no, a nice camper doesn’t make it better. In fact, it makes it worse. (Being lined up next to a hundred of my closest strangers in a campground makes me cringe.) The idea of no flushing toilets and no hot shower frightens me a bit. (And no, I’m no city slicker; I’m a ranch kid from Wyoming.) I just don’t like experiencing the outdoors in this fashion. However, I do LOVE the outdoors. Yes, I know this seems a little counterintuitive, but I could spend all day outside on a lake, on a trail, or on a mountain, but I want to come inside to shower and go to bed! When I do spend this time with Mother Nature, I prefer to have wine be a part of it. Mother Nature and wine...the perfect pairing! 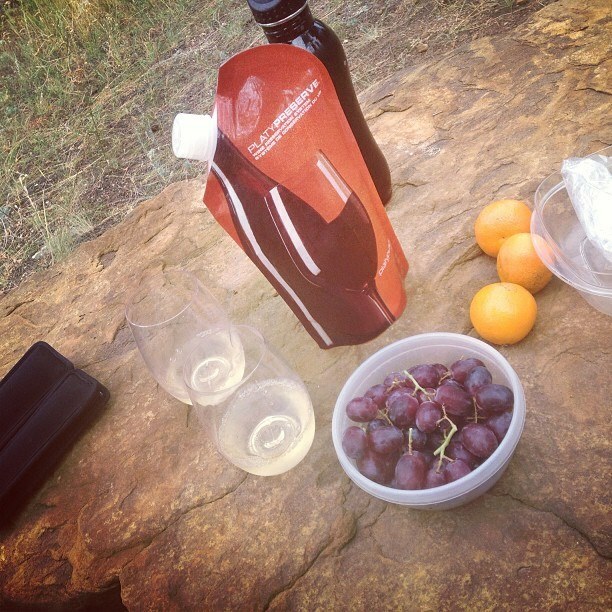 Wine and the outdoors tip one: invest in a wine carrier. There are multiple ways to carry wine outside. The industry has expanded beyond the regular glass bottle as a wine receptacle. Some wineries are using lighter wine containers for environmental and weight purposes. Plastic wine bottles, wine bags, single-serving portions, and wine boxes all weigh less and take up less space for hiking, biking, swimming, camping, or boating getaways. However, if outdoors people go with one of these options, like Copa Divino or Bota Box wines, they are at the mercy of the varietal, type, and style of wines those producers make. However, I like more flexibility in my wine choices than just having to drink the wines a few producers make and put in lighter weight containers. The answer to this problem is the Platypus brand PlatyPreserve. This is my favorite weapon in my wine and hiking arsenal. I pull the wine of my choice, pour it into my PlatyPreseve, put it in my backpack, and head to the hills! 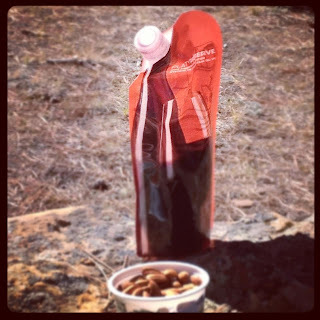 It holds exactly one 750 ml (milliliter) bottle of wine, is light weight, and is easy to carry. Wine and the outdoors tip two: invest in portable wine glasses. 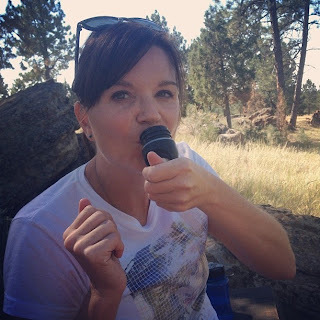 Just like there are differing ways to carry wine outside, there are several options for drinking wine outside. Again, some producers like Copa and Bota Box create individual serving sizes of wine making it so no actual glass is needed. However, the same negative issue happens again—the wines to choose from are then quite limited to what a few producers make. Thankfully, light weight and unbreakable “glasses” have come a long way. GSI Outdoors produces nesting glasses where the stem unscrews from the bowl of the glass and then snaps inside the bowl for easy traveling. GSI also makes stemless glasses out of strong plastic and both stemmed and stemless glasses out of stainless steel. The GoVino stemless glasses come in white, red, and sparkling styles and are made with appropriate bowl sizes and shapes for each style of wine. The plastic is thin yet durable, mimicking the thinness of crystal stemware. 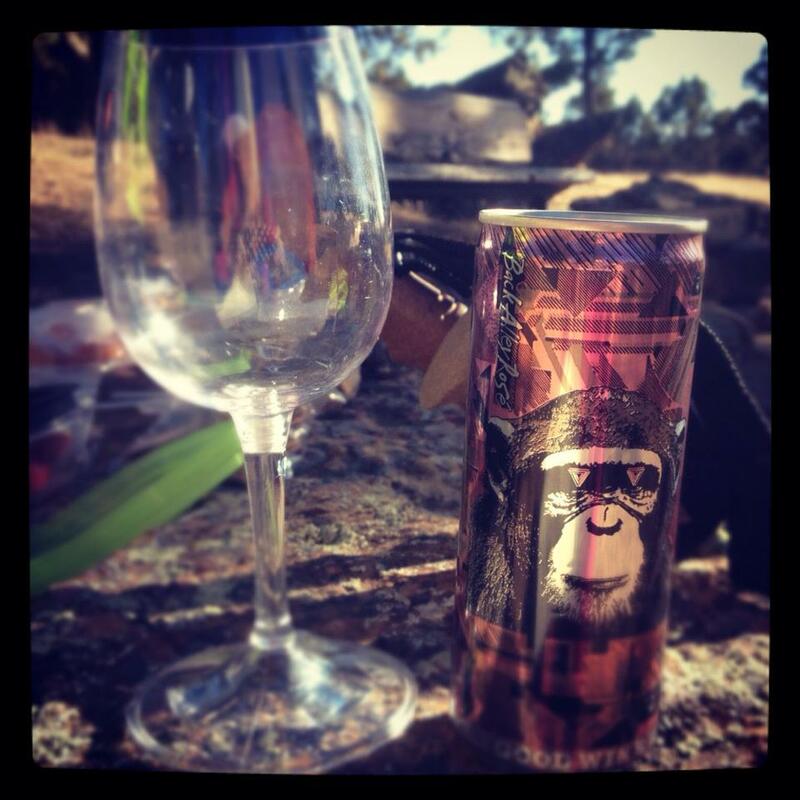 The newest outdoor drinkware option is the wine tumbler (made by numerous companies). This drinkware has a wine glass shape inside the outside tumbler with the sippy, travel coffee mug style lid. I have all of these kinds of glasses. My favorite is the GoVino because out of these glasses, wines taste and smell closer to how they would in actual glass stemware. Outdoor glassware is essential to enjoying wine in nature! The GoVino red (top) and the GSI Outdoors nesting glass (bottom). Wine and the outdoors tip three: keep food simple. 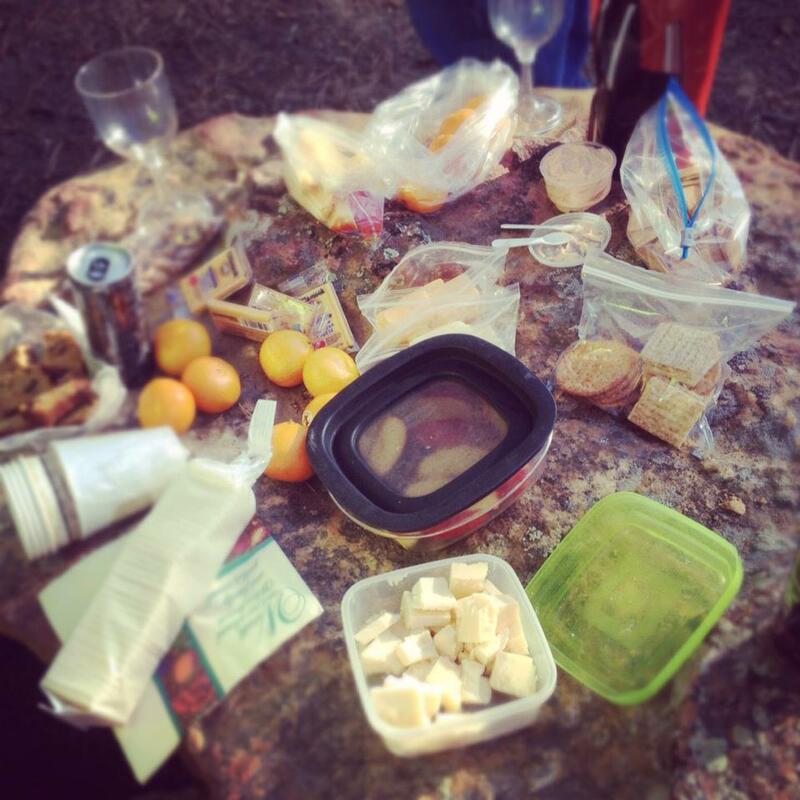 Let nature and the wine do most of the work to create an elaborate experience for your hike or picnic. The food needs to be simple and easy to carry. Fresh cut fruit, aged cheeses, and flavored crackers are enough to nibble on while sitting in a picturesque setting. If a more elaborate meal is the goal, make sandwiches on focaccia bread with garlic-basil aioli, lunch meat, tomato, and fresh mozzarella. Dessert can be as simple as homemade cookies, ‘smores bars, or chocolate chunks. These simple yet flavorful items are not only easy to prepare, but, more importantly, are also easy and lightweight to pack, making them the perfect outdoor cuisine. The number of summer days is waning, and winter is just around the corner. Though you won’t find me scurrying to get in my last days of camping as I feel fall’s nip in the air, you will find me trying to get into nature as many times as possible before Old Man Winter steals Mother Nature’s welcoming weather. Whether you prefer to hike a beautiful trail, bike through the hills, or camp on a lake, now is the time to enjoy the outdoors! 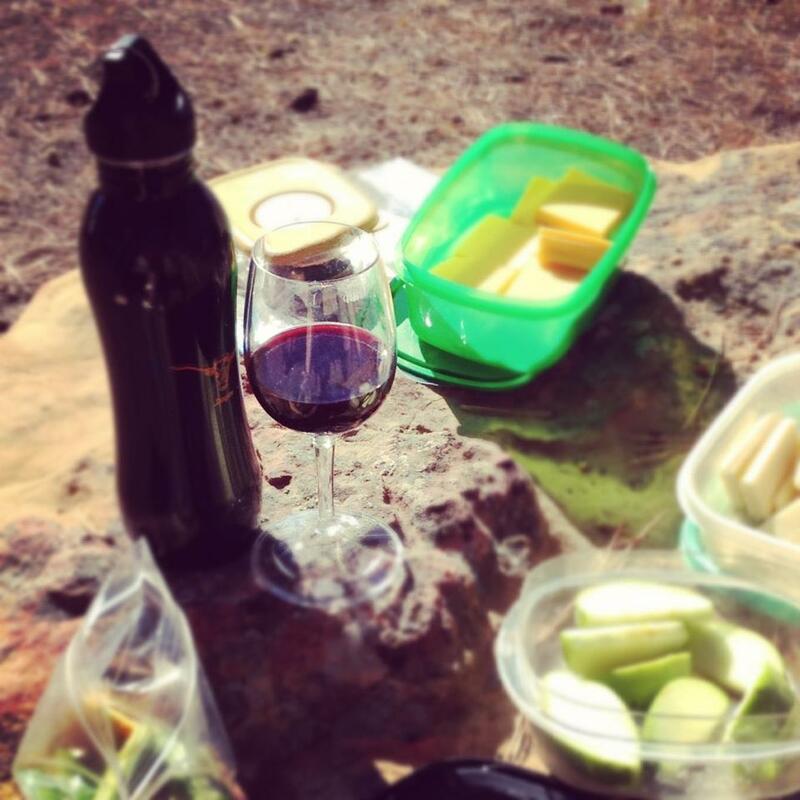 Make wine a part of your nature experience—it makes all aspects of the outdoors that much more pleasant.